Men's Obsidian and Sterling Silver Necklace, "Buddha Protector"
The powerful design of the necklace for men sees Buddha's smiling face. Similar to the Buddha depictions in Borobudur, the benevolent head rests atop a fang of clear obsidian. Bali's Henry Anthony Sanny crafts the sterling silver necklace by hand. 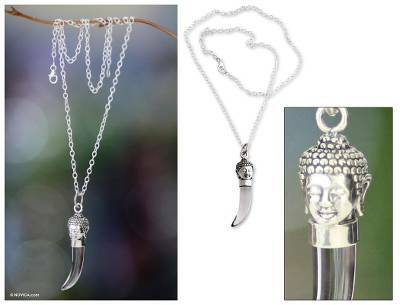 You can find men's obsidian pendant necklace 'Buddha Protector' by Henry Anthony Sanny in jewelry categories such as Karma Necklaces, Obsidian Necklaces, Silver Necklaces, Sterling Silver Necklaces and Pendant Necklaces. Enjoy exploring these sections for other Novica treasures.